It was good to go into the Big Star the other day and have my fish taco. If you haven't been to this Chicago taco joint it sure serves up a pretty excellent selection of tacos. I usually hit it up when I am craving a fish taco and my friend JR loves the bourbon list. 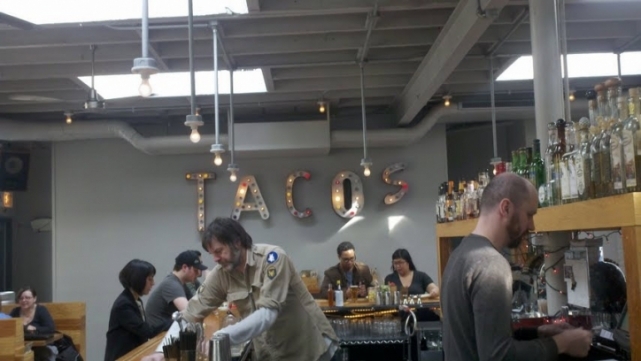 I was pleasantly surprised to see that they finally put up the Taco sign I sold them a while back--the fella closest to us in the photo found the 'S'. Team work! Posted on February 29, 2012 by Mariano Chavez and tagged big star marquee letters agent gallery tacos.